Horn antennas are often used as stand alone antennas as well as the feeds of large antennas such as parabolic mirror antennas, reflect antenna arrays and others. 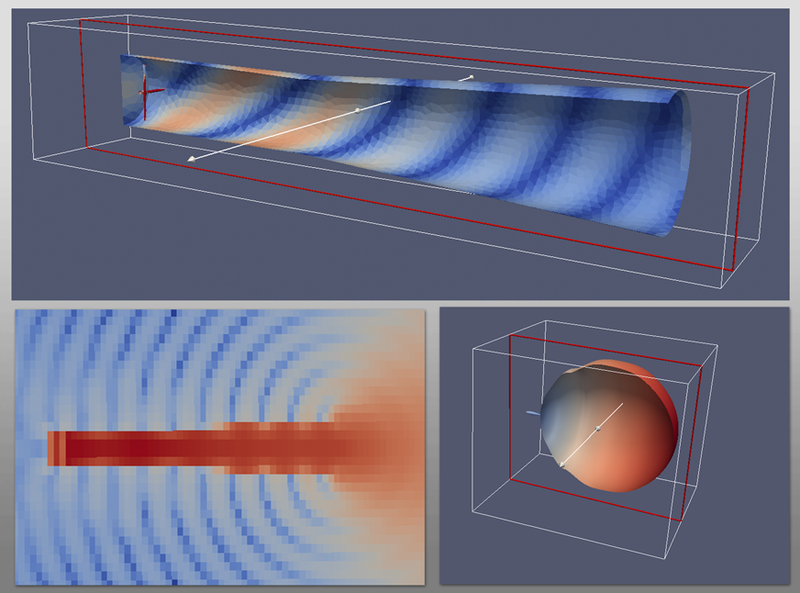 Wave3D allows for efficient modelling of such antennas including the excitation mechanism by auxiliary dipole and monopole antennas. Fig. 1: Current distribution (top), near field slice (bottom left), and far field pattern (bottom right) for circular horn antenna excited by crossed dipole antennas establishing circular polarization. Electrically large aperture antennas such as Cassegrain antenna are well suited for modelling with Wave3D computational suite. In this example we demonstrate the results of Wave3D analysis at 900 MHz for Cassegrain antenna featuring parabolic and hyperbolic mirrors with the diameters of 10 m and 1.25 m, respectively. The antenna is fed with a circular horn antenna excited with crossed electric dipole providing circular polarization of the waveguide principle mode. Fig. 2a: Distribution of surface current magnitude and its directions on the mirrors of 10 m Cassegrain antenna and its horn antenna feed at 900 MHz. The CAD model of the antenna and the feed consists of 404,832 surface elements. Fig. 2b: Near field produced by the antenna (left and center) and its radiation pattern at 900 MHz.